HippoChamp will launch a totally new selling concept for horse auctions. Forget the on-line, time consuming, auctions spread over multiple days to end finally three hours later as foreseen. At HippoChamp the LIVE on-line auction will start the 4 th of September at 20:00 hr PM ( Brussels time) and auctioneer Chris de Heer will sell LIVE continuously , one lot after another, until all 33 lots will be sold. Buyers have to bid through internet. ( www.equinia.com ). 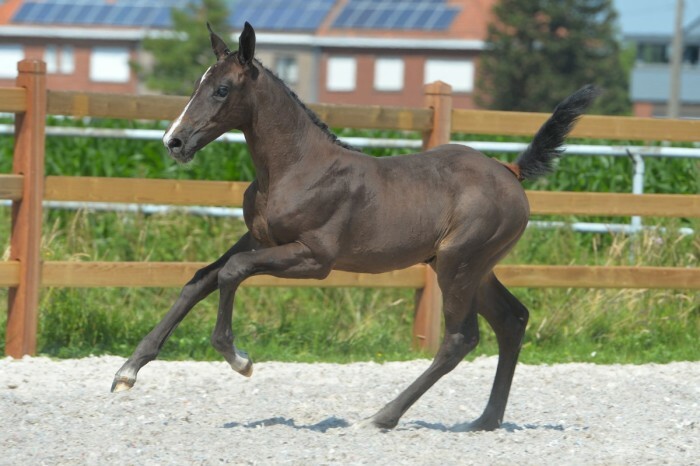 There are also many foals out of half sisters of TOP international show jumpers such as CASALL ASK (Rolf- Göran Bengtsson - SWE), JALISCA SOLIER (Steve Guerdat - SUI), PAPILLON Z (Jérome Guery - BEL), HOPE (Mohd Osama El Borai - EGY) , VINCA MAJOR VAN VLIERINGEN ( Pauline Guignery - FRA) , GASPER VAN DEN DOORN (Teddy Vlock - USA), CADE (Abigail Mc Ardle - USA), VARESCO DES ROSIERS (Nathan Budd - BEL), HAMLET VD DONKHOEVE (Kevin Thorton - IRL), almost all 1.60m horses ! There is also a special opportunity to buy a Top prospect for eventing. A colt foal by Toulon out of the FULL sister to the GR 1 - French Derby (2400m) winner ACT ONE. Act One is a multiple GR 1 winner in France !